Description: Andrew Wommack uncovers the traditions and misconceptions in prayer that often bring more suffering than good! In finding out how Jesus taught us to pray, we can bring joy back into our relationship with God. Many people, who truly love God with all of their heart, find it difficult to pray as they have been taught. And their once-vibrant relationship with the Lord has become stifled, mechanical, and lifeless. What they don’t understand is that prayer is an opportunity to have communion with God - fellowship with the Father. Of course it includes requests because we need help from our Father every day, but it also includes a connection and friendship with God. Readers may find it amazing that God would talk with them just as a friend, but His greatest desire is for His children to know Him in much the same, intimate way as He knows them. 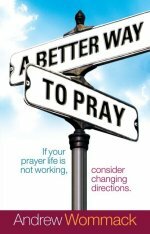 After 30 years of ministry, Andrew Wommack has discovered some important things about prayer including what prayer is and what it is not. Readers will uncover the traditions and misconceptions in prayer and discover true and meaningful communion with God through Jesus’ example of prayer. More importantly, they’ll come to know a new, profound joy and fulfillment in their relationship with God, receiving the answers they need.